Check out 10 finger touchscreen recognition! 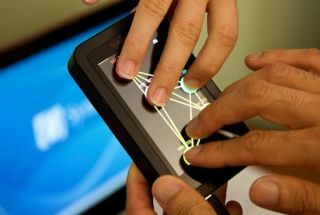 Synaptics, that clever touchscreen making company, has decided two fingers bad, ten fingers good when it comes to touch displays. The new Synaptics Clearpad 3000 allows you to use all your fingers and thumbs on the screen, meaning even more accurate recognition when pinching and zooming. Obviously this isn't much good for your average web browsing on the iPhone 3GS, but when mobile phones head into the third dimension this method will make things much easier to navigate. The Clearpad 3000 has 48 sensing channels, and works with screens up to eight inches in size, using more accurate capacitive technology. And for the lower end touchscreen mobiles messing about with less-responsive resistive screens, the Clearpad 1000 has also been released for a cheap alternative. It also works with OLED screens too, improving the accuracy so the next 12 months should see some tip top mobile screen tech heading our way. Ace.